This book provides a gentle yet efficient and comprehensive introduction to modern algorithmic design and computer programming. 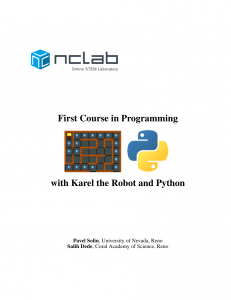 It consists of two programming languages - Karel the Robot and Python. This free textbook will help you discover the elegance and power of procedural and object-oriented programming with Karel the Robot and Python. The former is a famous educational language created at the Stanford University, the latter is a modern high-level dynamical programming language that is used in many areas of business, engineering, and science today. After taking this course, you will have solid theoretical knowledge and vast practical experience with computer programming.